A nice review, asus finding unique promising form factors focused on content generation. I understand the appeal of tablets. Regardless of OS, they all provide a far more intimate experience when browsing the web and reading emails. I genuinely prefer doing both of those things on a tablet than on a notebook or desktop. Then there are the apps. Photos, maps, ebooks, videos and even IP cameras are comfortably accessible from tablets. Obviously you can do the same on a notebook or desktop, the tablet form factor combined with a responsive touch UI simply means you can do these things in a more relaxed position. What has always frustrated me with tablets however is what happens when you have to give any of these apps a significant amount of input. While the virtual keyboards on tablets are pretty mature, the form factor doesn't allow for quick typing like on a smartphone. A smartphone is easily cradled in both of your hands while your thumbs peck away at the keyboard. A tablet however needs to be propped up against something while you treat it like a keyboard. Put it on your lap and you have to hunch over the thing because the screen and input surface are on the same plane (unlike a notebook where the two are perpendicular to one another). Try to type in a reclined position on a couch and you end up lying awkwardly with your thighs and thumbs supporting the tablet. Ever see the iPad billboards and note the really awkward leg placement in them? ASUS' latest attempt to deal with this issue is the Eee Pad Slider. 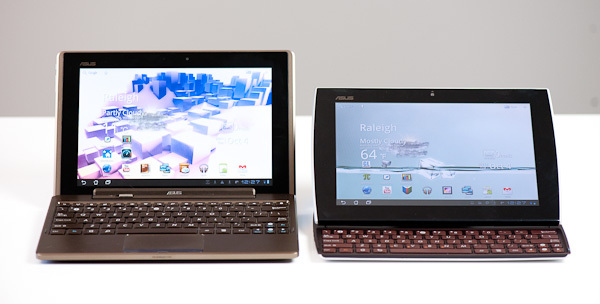 The follow-on to the Eee Pad Transformer integrates a sliding keyboard into ASUS' Honeycomb tablet. How does it fare? Read on to find out in our full review!